LixPOyNz is an amorphous solid electrolyte widely used in microbattery devices. 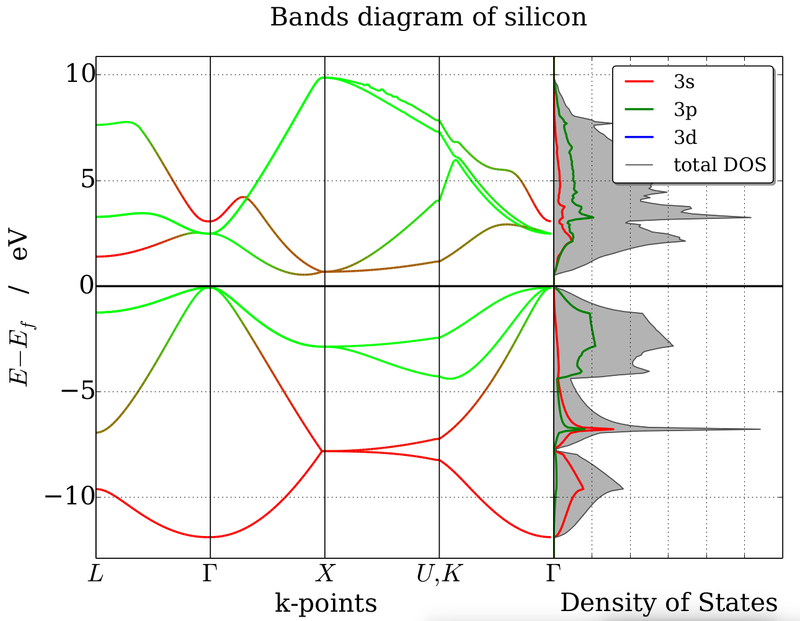 The present study, based on a confrontation between experiment and theory, aims at providing new knowledge regarding the ionic conductivity model of such systems in correlation with its structure. The computational strategy involved molecular dynamic simulations and first-principle calculations on molecular and periodic models. The experimental target data involve electronic and vibrational properties and were considered through the simulation of Raman and X-ray photoemission spectra in order to identify characteristic patterns of LixPOyNz. In particular, the presence of short phosphate chains is suggested by molecular dynamics calculations, and the simulation of Raman spectra clearly evidenced a new coordination for nitrogen atoms in the amorphous state, not considered until now in the experimental structural model of the electrolyte and initially hypothesized based on core level binding energy computations. Monovalent nitrogen atoms together with short phosphate chains were used to build a structural model of the electrolyte and appeared to lead to a better reproduction of the target experimental results, while it implies a necessary refinement of the diffusion schemes commonly considered for lithium ions. Guille, É.; Vallverdu, G.; Tison, Y.; Bégué, D.; Baraille, I. 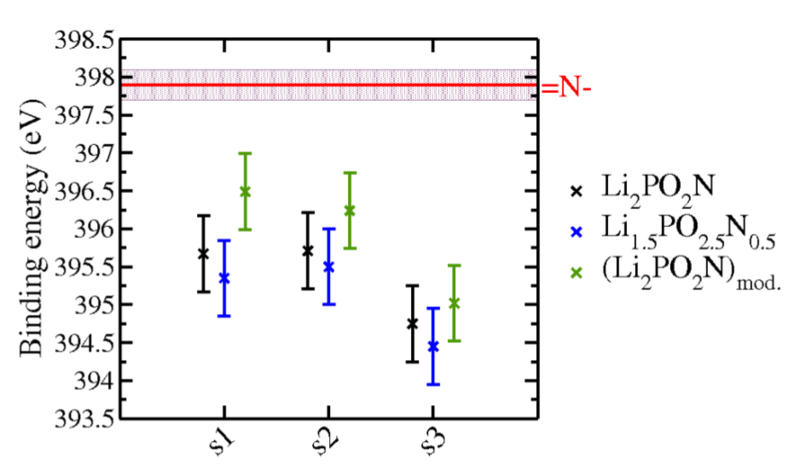 Possible Existence of a Monovalent Coordination for Nitrogen Atoms in LixPOyNz Solid Electrolyte: Modeling of X-Ray Photoelectron Spectroscopy and Raman Spectra. J. Phys. Chem. C 2015. 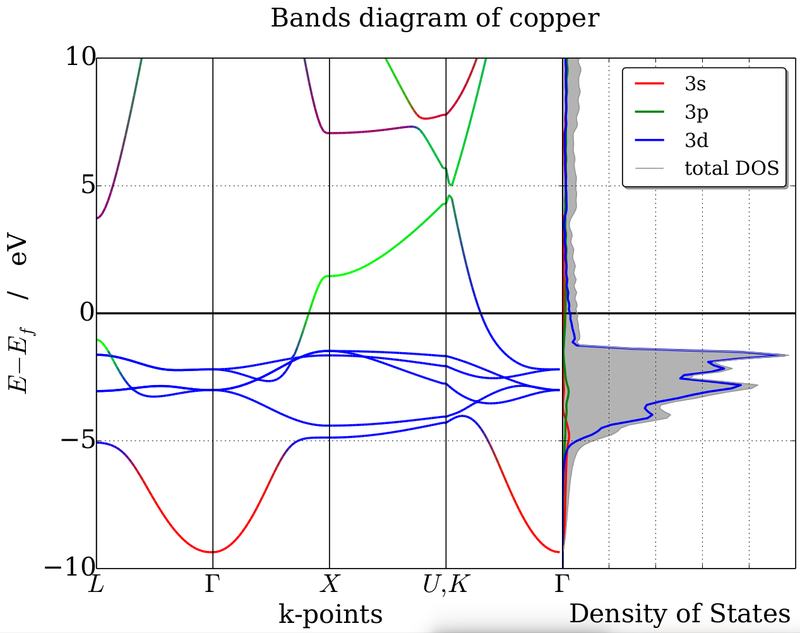 We present first-principle calculations of core-level binding energies for the study of insulating, bulk phase, compounds, based on the Slater-Janak transition state model. 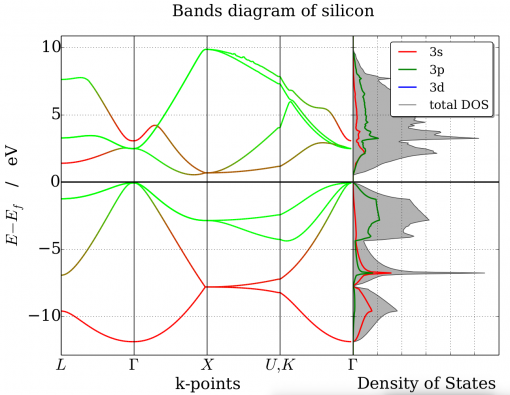 Those calculations were performed in order to find a reliable model of the amorphous LixPOyNz solid electrolyte which is able to reproduce its electronic properties gathered from X-ray photoemission spectroscopy (XPS) experiments. As a starting point, Li2PO2N models were investigated. These models, proposed by Du et al. on the basis of thermodynamics and vibrational properties, were the first structural models of LixPOyNz. Thanks to chemical and structural modifications applied to Li2PO2N structures, which allow to demonstrate the relevance of our computational approach, we raise an issue concerning the possibility of encountering a non-bridging kind of nitrogen atoms (=N-) in LixPOyNz compounds. Guille, É.; Vallverdu, G.; Baraille, I. First-Principle Calculation of Core Level Binding Energies of LixPOyNz Solid Electrolyte. The Journal of Chemical Physics 2014, 141, 244703. 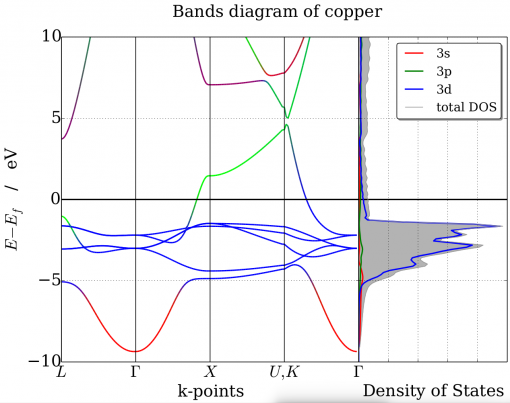 Using periodic density functional theory approaches, the thermodynamic stability of solid-solid interfaces generated during the conversion reaction of copper oxide which is a promising electrode material is investigated. 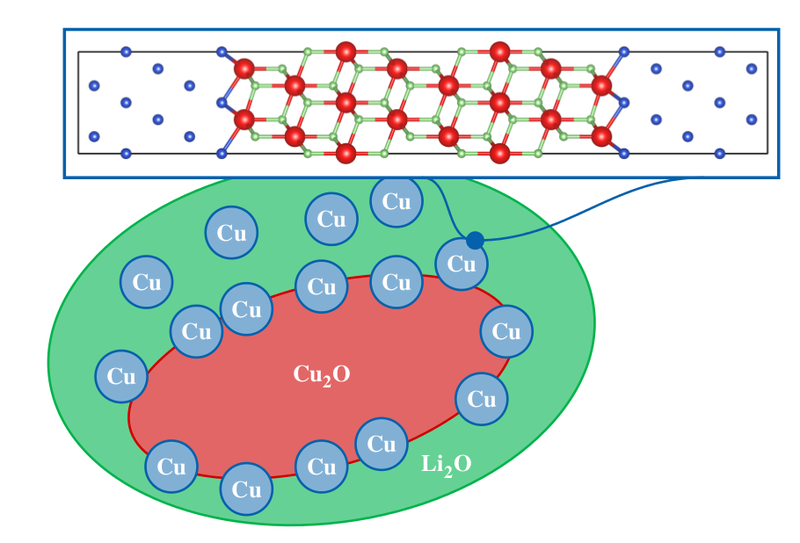 Previous experimental results showed that conversion reactions generate a huge proportion of solid-solid interfaces among Cu2O-Cu, Li2O-Cu and Cu2O-Li2O. 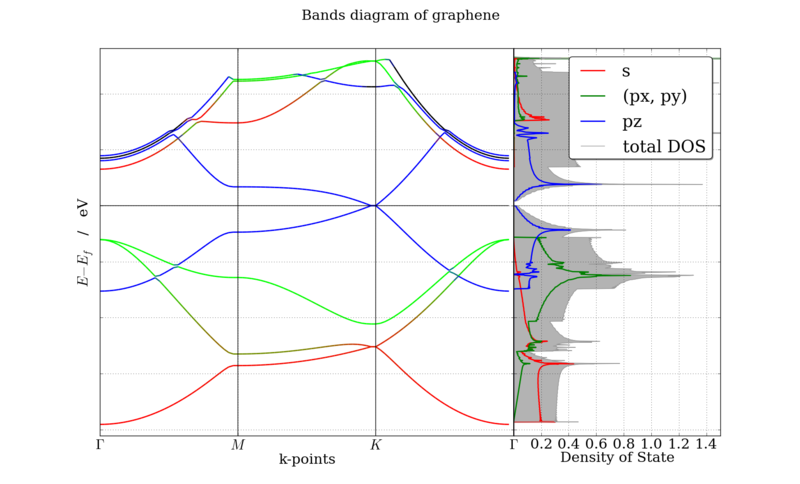 Interface grand potentials as a function upon the voltage against a Li|Li+ were computed in order to determine the chemical composition of the most stable interfaces. Then a structural model of the electrode material is proposed, based on the work of adhesion of the most stable systems identified in the first step. I present here simple convenient functions to plot a matplotlib colormap or a color palette. 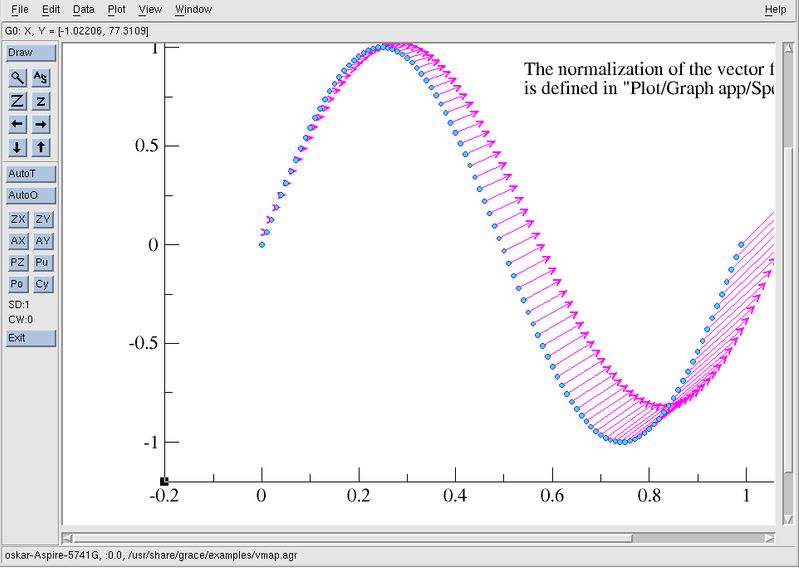 The source codes of the functions are available on this gist. 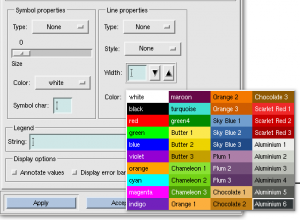 You can use either its name or the matplotlib.cm.colormap object. 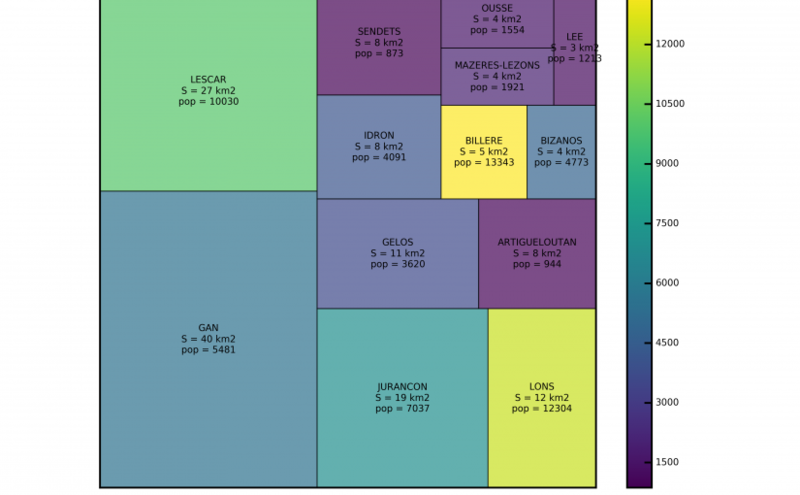 Here is an example of a treemap plot using python, matplotlib and the squarify module. The data comes from the open data of the Communauté d’Agglomération Pau-Pyrénées. Here is an other version where Pau is present. 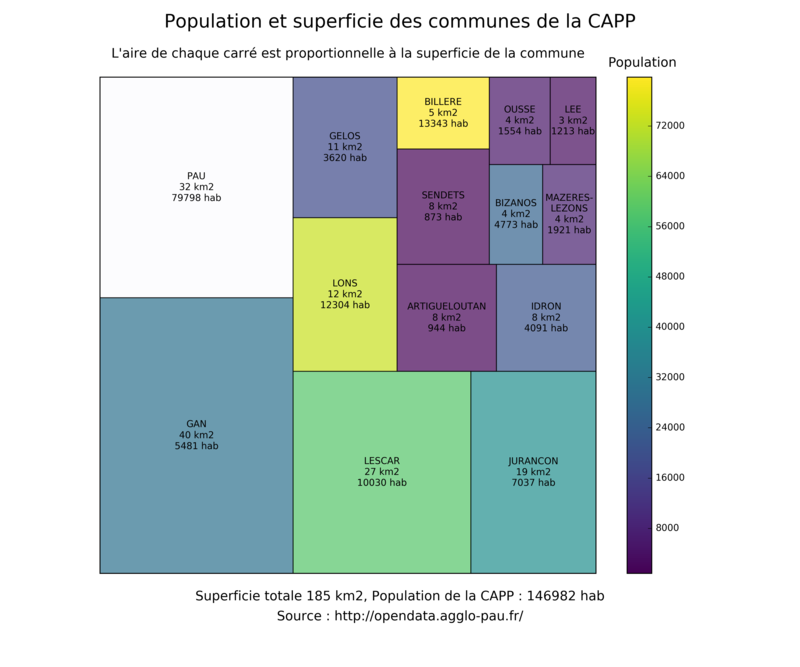 Nevertheless, I draw a white square background because the population of Pau is huge compared to other towns and thus I did not include it in the color scale. 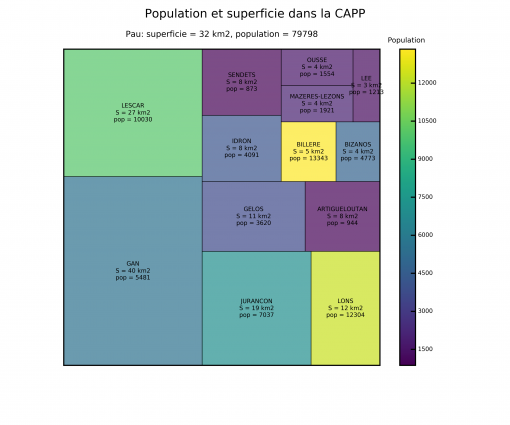 Grace et plus précisément sa version graphique xmgrace (anciennement xmgr) est un outil permettant de concevoir des graphiques en deux dimensions (XY, polaire, logarithmique, boxplot …) ainsi que faire un peu d’analyse numérique (regression, interpolation, intégration …) et réaliser quelques traitements sur les données. Les graphiques obtenus sont de haute qualité et peuvent être exportés sous divers formats vectoriels (eps, ps, svg) ou non (png, jpg …). 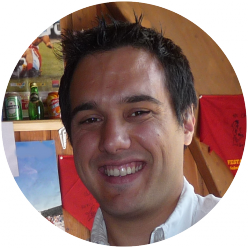 Le paquet est disponible sous ubuntu (apt://grace), fedora et la plupart des distributions linux. alias xm="LANG=fr_FR xmgrace -geometry 1150x900"
L’option geometry permet quand à elle de faire en sorte que la fenêtre de xmgrace soit suffisamment grande pour voir la totalité du graphique. Si les dossiers n’existent pas, il faut les créer. @map color  0 to (255, 255, 255), "white"
@map color  1 to (  0,   0,   0), "black"
@map color  2 to (255,   0,   0), "red"
@map color  3 to (  0, 255,   0), "green"
@map color  4 to (  0,   0, 255), "blue"
@map color  5 to (148,   0, 211), "violet"
@map color  6 to (255, 165,   0), "orange"
@map color  7 to (  0, 255, 255), "cyan"
@map color  8 to (255,   0, 255), "magenta"
@map color  9 to (114,  33, 188), "indigo"
@map color 10 to (103,   7,  72), "maroon"
@map color 11 to ( 64, 224, 208), "turquoise"
@map color 12 to (  0, 139,   0), "green4"
@map color 13 to (252, 233,  79), "Butter 1"
@map color 14 to (237, 212,   0), "Butter 2"
@map color 15 to (196, 160,   0), "Butter 3"
@map color 16 to (138, 226,  52), "Chameleon 1"
@map color 17 to (115, 210,  22), "Chameleon 2"
@map color 18 to ( 78, 154,   6), "Chameleon 3"
@map color 19 to (252, 175,  62), "Orange 1"
@map color 20 to (245, 121,   0), "Orange 2"
@map color 21 to (206,  92,   0), "Orange 3"
@map color 22 to (114, 159, 207), "Sky Blue 1"
@map color 23 to ( 52, 101, 164), "Sky Blue 2"
@map color 24 to ( 32,  74, 135), "Sky Blue 3"
@map color 25 to (173, 127, 168), "Plum 1"
@map color 26 to (117,  80, 123), "Plum 2"
@map color 27 to ( 92,  53, 102), "Plum 3"
@map color 28 to (233, 185, 110), "Chocolate 1"
@map color 29 to (193, 125,  17), "Chocolate 2"
@map color 30 to (143,  89,   2), "Chocolate 3"
@map color 31 to (239,  41,  41), "Scarlet Red 1"
@map color 32 to (204,   0,   0), "Scarlet Red 2"
@map color 33 to (164,   0,   0), "Scarlet Red 3"
@map color 34 to (238, 238, 236), "Aluminium 1"
@map color 35 to (211, 215, 207), "Aluminium 2"
@map color 36 to (186, 189, 182), "Aluminium 3"
@map color 37 to (136, 138, 133), "Aluminium 4"
@map color 38 to ( 85,  87,  83), "Aluminium 5"
@map color 39 to ( 46,  52,  54), "Aluminium 6"
@map color 0 to (255, 255, 255), "white" @map color 1 to ( 0, 0, 0), "black" @map color 2 to (255, 0, 0), "red" @map color 3 to ( 0, 255, 0), "green" @map color 4 to ( 0, 0, 255), "blue" @map color 5 to (148, 0, 211), "violet" @map color 6 to (255, 165, 0), "orange" @map color 7 to ( 0, 255, 255), "cyan" @map color 8 to (255, 0, 255), "magenta" @map color 9 to (114, 33, 188), "indigo" @map color 10 to (103, 7, 72), "maroon" @map color 11 to ( 64, 224, 208), "turquoise" @map color 12 to ( 0, 139, 0), "green4" @map color 13 to (252, 233, 79), "Butter 1" @map color 14 to (237, 212, 0), "Butter 2" @map color 15 to (196, 160, 0), "Butter 3" @map color 16 to (138, 226, 52), "Chameleon 1" @map color 17 to (115, 210, 22), "Chameleon 2" @map color 18 to ( 78, 154, 6), "Chameleon 3" @map color 19 to (252, 175, 62), "Orange 1" @map color 20 to (245, 121, 0), "Orange 2" @map color 21 to (206, 92, 0), "Orange 3" @map color 22 to (114, 159, 207), "Sky Blue 1" @map color 23 to ( 52, 101, 164), "Sky Blue 2" @map color 24 to ( 32, 74, 135), "Sky Blue 3" @map color 25 to (173, 127, 168), "Plum 1" @map color 26 to (117, 80, 123), "Plum 2" @map color 27 to ( 92, 53, 102), "Plum 3" @map color 28 to (233, 185, 110), "Chocolate 1" @map color 29 to (193, 125, 17), "Chocolate 2" @map color 30 to (143, 89, 2), "Chocolate 3" @map color 31 to (239, 41, 41), "Scarlet Red 1" @map color 32 to (204, 0, 0), "Scarlet Red 2" @map color 33 to (164, 0, 0), "Scarlet Red 3" @map color 34 to (238, 238, 236), "Aluminium 1" @map color 35 to (211, 215, 207), "Aluminium 2" @map color 36 to (186, 189, 182), "Aluminium 3" @map color 37 to (136, 138, 133), "Aluminium 4" @map color 38 to ( 85, 87, 83), "Aluminium 5" @map color 39 to ( 46, 52, 54), "Aluminium 6"
Il sera alors inutile de passer par le menu « print setup » avant d’exporter un graphique. Changer le paramètre "EPS" par le format de sortie qui vous convient.